When you want to do minor repairs on your vehicle, you don't have to take it to the mechanic. It is something you can do for yourself in the garage. Well, it is not as if DIY or professional repair does not come with its difficulties and risks. Therefore, you will need to have a car lift that can assure easy and secure lifting of your vehicle for repair. This is where some of the best names in the market like Dannmar and Bendpak come in. 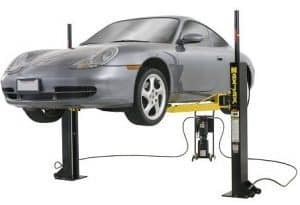 In our best 2 post car lift review, these are among the best options that you can turn to when you want to include this essential aspect in your shop or home garage. In this article, you are going to see some of their best lifts. This is one of the most sought after 2- post lifts in the market, and it does the job if you install it well. However, it is important to ensure safe installation, as a failure here could have drastic consequences. This lift is portable for movement around your workspace in case you do not have enough area to do other work. With up to 6,000 lbs lifting power, this lift is a machine that delivers to expectation. However,it does not mean you have to call in another person to help you move it around when you want to create some more space. Moreover, the lift is just the right size to fit indoors without giving you problems with the ceiling. It also packs a good number of features to offer you the best support for your car as you work on its repairs. It is not only a sturdy structure but also one that comes with sufficient power to raise small cars as well as trucks and SUVs. It is an inevitable fact that you do not want to have a lift that can only offer for one type of a vehicle. Besides, it can also be helpful if you want to raise a motorbike for repair, it also caters to this task as well. This is why the MaxJax is a one-fits-all machine. 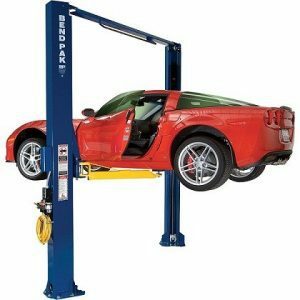 Whether you are doing major repairs on your car or minor ones, this lift gives you a good return on your money. Although it has its shortcomings like getting old with time, it offers service that you can count on. If you need to adjust some of its aspects like drilling holes on the shafts for safety bar, you can do it as well for efficiency. MaxJax lift is efficient and convenient, easily portable, yet strong enough, offering the best of both worlds. It is easy to install and use, which you can do all alone, especially for DIYers. This lift provides an upgrade over the regular jack stands when coupled with its creation of ample working space. This lift can be uneven. It is also possible that its hydraulic cylinders will develop leakage with time. It also has a challenge lifting a 5500 lb vehicle. Another lift every car owner and professionals want. This lift comes with its fair share of recognition for all the right reasons. If you are looking for 2-post vehicle lift, then this product can come to your rescue. With this capacity to lift up to 10,000 lbs up to as high as 69 inches, this lift offers an unprecedented power. It measures 132"-145" in width, with a pad height of 4" and overall height at 145". It has 1 motor phase, producing 220 Volts. BendPak further offers a range of options in installing. You can go for the broad or narrow option, what works best for you. It is also worth mentioning that it is also ideal for different types of vehicles. It offers safety features to ensure you do not put your life at risk as you work on your car. These include a safety release feature and a full overhead bar for safety too. The versatile top beam offers for wide or narrow configuration for your preferred drive through. The BendPak also packs several features for maximum service with the least maintenance cost. This makes it an ideal option when looking for a lift with excellent productivity at low operating cost. Safety features for enhancing safe operation while under your vehicle. It also enables substantial weight lifting power for loading heavier vehicles. It further features reliable flexibility to give the user options for configuration. It's fast lifting speed, in essentially less than a minute, is an added advantage of this lift. One and the significant shortcomings of this lift is that it does not cater for the lifting of cars lower to the ground. This lift comes with some features that make it both efficient and powerful. It is well constructed with several safety features as well. Moreover, it is easy to install and use, which makes it one of the best types of its class. One unique thing about this lift is its lifting speed. Along with its low maintenance cost, this lift is a monster. It is also fitted with dual direct drive low-pressure cylinders for increased power. Safety is one of the things about this lift that stand out. With fitted locks and a padded overhead bar, you can work with this lift without worry at all. This lift has an overall height of 145", a single motor phase of 220 volts and capacity to lift 10,000 lbs. Its overall width is 132" to 145". It has 45 seconds raising speed. Offer electric or hydraulic power system. All these offer one of the best lifts you can find on the market. Fast rising speed for secure and reliable operation. Heavyweight lift beyond most other lifts. Easy to install and use, making it convenient and secure. Efficient safety features to ensure you do not have to put your life at stake to use it. The electrical box is a bit small, making it tight inside thus difficult to get the cable tension equal, especially for the novice. 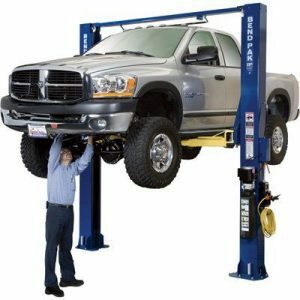 Having a reliable and well-performing car lift is one of the inevitable necessities for any garage. You need to have something that can make the work easier for you in lifting your vehicle or motorbike for repair, and these lifts get the job done. If you have not tried one out, then now is the time to check them out and witness what they are capable of.